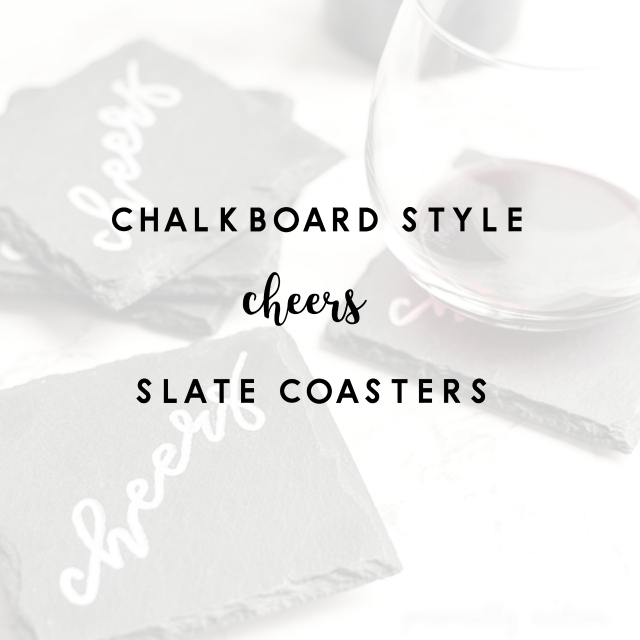 How to create chalkboard look lettering on slate coasters with a white paint marker. These make a lovely and personalized gift for your host/hostess, teacher or as a housewarming gift. Hey everyone! 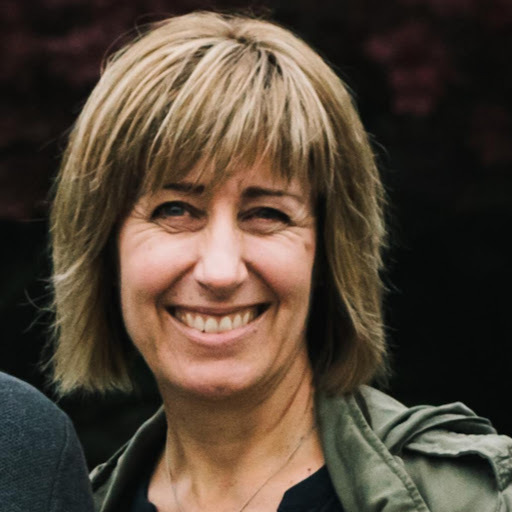 Welcome back to Personally Andrea! We are finally slowing down into a summer vibe. The weather has heated up and we’re enjoying the longer daylight hours, especially in the evenings. How about you? So today, I have a really straightforward DIY that you can make for your own backyard enjoyment or entertaining. Also, if you’re looking for something personal to give as a gift for any of your occasions this summer, these are a great idea! I think they'd be great as a hostess or housewarming gift alongside a bottle of your favourite wine. 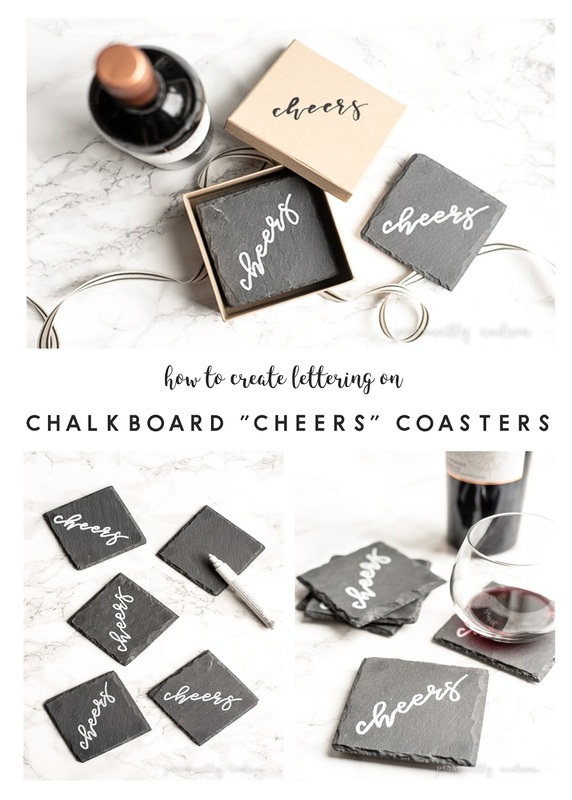 I used a method I’ve used often before to create the lettering on the coasters. If you’ve been reading here for a while you’ll remember this popular post on Two Ways to Paint Lettering onto Rustic Wood. I also use it for the chalkboards you’ll sometimes see on my instagram feed, and this Framed Monogram. Here’s a quick recap of the tutorial, but please check back to the Lettering post for more details and lots of step-by-step photos. 1. 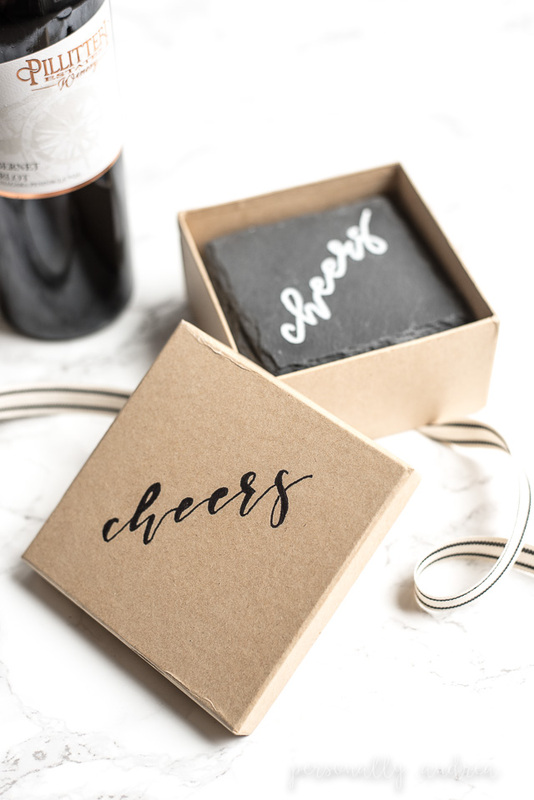 On your computer’s word processor, type out the word “cheers” using the Argentinian Nights font, and size it to 9 cm or 3 1/2 inches using the rulers on your word processor. Repeat 2-3 times to create several templates. 2. Print out your templates onto plain white paper. 3. 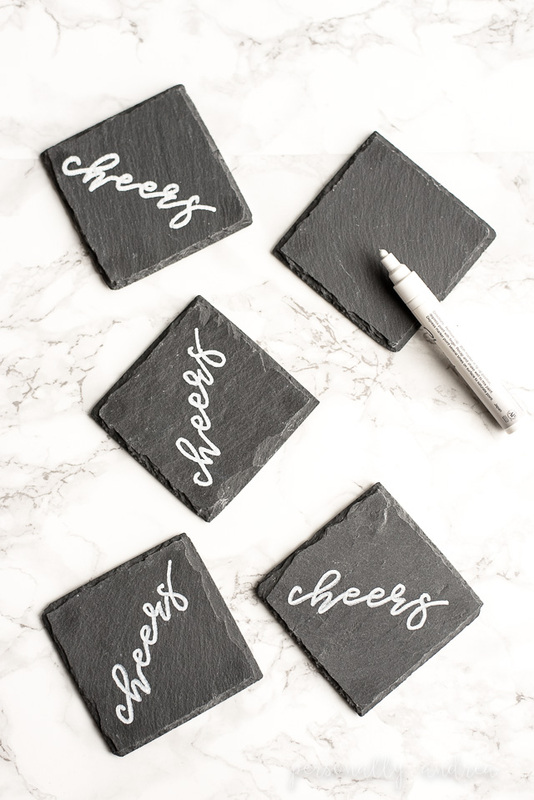 Use a piece of white chalk to cover the back of one of the printed word templates. 5. Use a white paint marker to follow the chalk markings and create the lettering for your word. Work slowly to allow for an even flow of the “paint”. 6. Repeat using the same template until you see the tracing becoming too faint or blurry. Then use the next printout to create a new template, keeping in mind the note from step 4. 7. 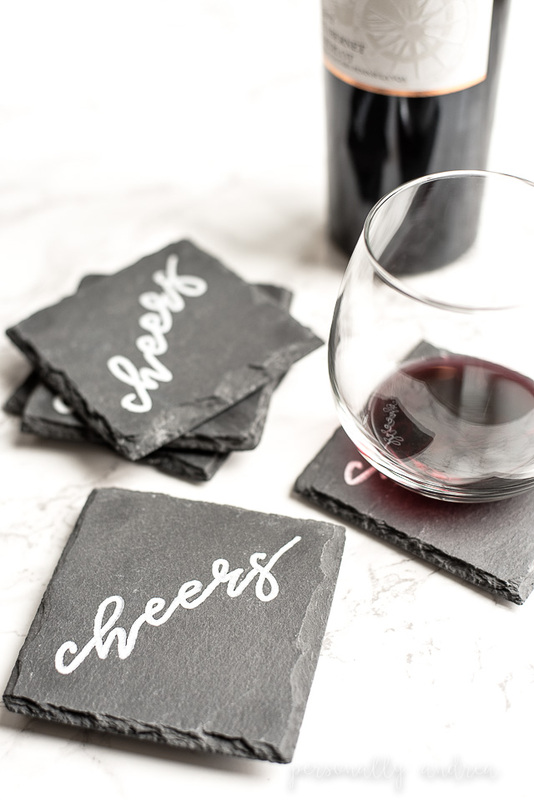 Read the directions on your marker for drying times, and then your coasters are ready to use. If you’re making them as a gift, you can package them into a box (this one is from Dollarama) with the same lettering repeated on the cover. Beautiful gift-giving made easy! Cheers! Hoping you can make time for a little creativity in your day!